The third-generation Toyota Auris will bear the Corolla name when it goes on sale in early 2019 for an expected £21,000. Toyota hasn’t made it clear why it has decided to bring the Corolla back, but from 2019 the Auris nameplate will be dropped globally. This means the next-gen Auris, which was launched at the Geneva Motor Show, will be rebranded as Corolla. 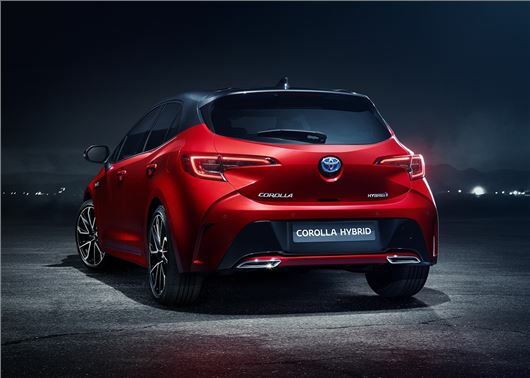 “There is no better moment than the launch of the upcoming new generation model to reintroduce the Corolla name to our C-segment hatchback and wagon,” said Dr Johan van Zyl, President and CEO of Toyota Motor Europe. The new Corolla will take the Auris' place on the UK production line at the Burnaston plant in Derbyshire, and be built on the same mechanical platform as the Prius and C-HR. The engine line-up will start with the 100PS 1.2 petrol and feature the all-new 2.0 petrol hybrid with 177PS. Diesel engines have been dropped entirely from the model range, but the 120PS 1.8-litre petrol hybrid from the outgoing Auris will be offered. Toyota is promising sharper driving dynamics and better comfort with the 2019 Corolla, with a stiffer set-up and new multi-link suspension. The 2.0-litre hybrid will debut Toyota’s latest CVT gearbox and feature a launch gear to improve refinement and economy at low-speeds. There are no official details on fuel economy or pricing; however, the Corolla is expected to mirror the £21,000 entry price point of the Auris. The new Corolla Touring Sports wagon will have its world premiere at the Paris Motor Show on 2 October, appearing alongside the new hatchback. It does (unsurprisingly) bear a resemeblence to the God-awful looking Lexus CT 200h, especially from the rear. Let's hope that the new 'better handling' actually is far better than the Lexus, as the current car isn't as good on that score as 10+ year old cars like my Mazda3. Toyotas may be uber-reliable, but other than the GT86 they aren't great drivers' cars. They need to at least match the Hyundai i30/KIA Ceed to start regaining market share that they lost with the Auris. The 'old' Corolla at least didn't pretent to be anything other than reliable transport for the elderly. If its too expensive, then thos two makes will keep making gains at Toyota's expense. Honda seem to have responded. Can Toyota? Hmmm. It does (unsurprisingly) bear a resemeblence to the God-awful looking Lexus CT 200h, especially from the rear. Let's hope that the new 'better handling' actually is far better than the Lexus, as the current car isn't as good on that score as 10+ year old cars like my Mazda3. Toyotas may be uber-reliable, but other than the GT86 they aren't great drivers' cars. They need to at least match the Hyundai i30/KIA Ceed to start regaining market share that they lost with the Auris. The 'old' Corolla at least didn't pretent to be anything other than reliable transport for the elderly. If its too expensive, then thos two makes will keep making gains at Toyota's expense. Honda seem to have responded. Can Toyota? Hmmm. Chartered?. What discipline are you qualified in?. Interested to hear from a properly qualified professional. I'm a mechanical engineer, though in Building Services (a part of the Construction Industry) - I design heating, ventilation and A/C systems amongst other things. Well, I did, for 18+ years (I never got round to getting chartered); I've now jacked it in as I didn't like the cr*p I had to put up with and all the BS with cutting corners, plus the long hours. Now racking my brain for another career that's fulfilling without spending a fortune on re-training that might come to nothing. Hence why I can post here regularly - I currently have a lot of time on my hands. I'm no motoring expert, but am very observant (for the most part) about issues that are either interesting or important to me. I do post regularly on the forum, but there are a good number of people far more qualified than me on the technical side of cars. Worth joining/using (if you've already got a log-in here) to chew the fat/discuss issues of importance regarding motoring or specific problems and issues. I have a soft-spot for Toyota as I've occasionally taken my money to other manufacturers whilst looking for more excitement or value for money and then regretted it. I 'treated' myself to a new Mazda MX-5 once and it was the worst car ownership experience I've ever had; the car / dealership / Mazda UK all being terrible. I went back to Toyota afterwards and it was like being greeted by an old friend. That car also exceeded my expectations whilst never letting me down, i.e. the complete opposite of my Mazda. So to see the new Corolla with great styling (in my opinion) and the promise of a decent drive are added bonuses for me. What was wrong with the MX-5 and the circumstances of your problem(s)? The petrol-engined Mazdas (I've owned a 3 from new for more than 12 years without one fault of significance) are normally (except the rotary engined ones, although often that's more to do with people using them for short trips) very reliable. I agree that Mazda dealerships on the other hand, are I admit, somewhat hit and miss, rather like Ford, and Mazda UK didn't have a good reputation for customer care, but have improved of late. I am a fan of the Toyota brand, but not of all of their cars. My wife and I have owned a GT86, three RAV4s, two Yaris, one Auris and an Aygo. Thank goodness Toyota are at last going to produce a car that will appeal to me again, can't wait to try the 2.0lt hybrid. I have never liked the appearance of the Auris, and having owned two Toyotas, a petrol Carina and now an automatic petrol Avensis Tourer, both of which have been conservative but very practical, have considered deserting Toyota for our next car. In both Israel and Eire, I have seen a Corolla which Toyota have chosen not to market in the UK, and been struck by how much the body shape appealed to me. But they chose to market the lacklustre Auris in the UK. I hope therefore that they are seeing the light, unless they go stupid with the new design as they have with the C-HR.